“The organic market continues growing. Germany has become the largest market for organic products within the European Union”, summarized Ilse Aigner, German minister for agriculture the published data of 2011 about the organic sector in Germany. Organic farming is based on the idea of sustainability, environmentally friendly and nature-orientated farming and the consideration of animal welfare. It is the first time that the total acreage of organic farming exceeded 1 billion hectares. According to the annual report of the ministry of agriculture the total organic acreage increased by 3.2 percent while the number of farms raised by 2.6 percent compared to the previous year. The definition for organic farming and the converting of organic products is based on a closed loop recycling management that should ensure the sustainability. High biodiversity in fields and meadows, minimized losses of nitrogen and CO2-fixation through increase of humus are becoming necessary efforts in times of climate change. Their importance and the significance of animal welfare in the modern society are associated with the demand for organic products. The requirements for organic products are high. Strict guidelines and regular controls on organic farms should ensure the compliance. Nevertheless, in areas such as animal welfare, and concerning health and feeding, the conditions are improvable. The proportion of organic farms accounted for 7.5 percent of the overall number of farms in 2011. The share of organic acreage of the total agricultural land has increased by 6.1 percent in the last year. Furthermore, the converting of organic products experienced 4.5 percent growth while organic trading companies recorded a growth of 11.3 percent. In comparison to the previous year the number of importers increased by 8.4 percent. Although the percentages of organic farming to the total numbers of German agriculture are still small, the growth of this market within the last years will most likely hold on the next years. The German government and the European Union backed this growing market in 2011 with 137 billion Euros in subsidies. Farmers who convert from conventional to organic farming were attracted with conversion bonuses from 210 to 480 Euros per hectare within the first years. Nevertheless, the potential of this market is not utilized yet as the rising demand for its products demonstrates. According to a survey of the study group “Biomarkt”, the organic market share accounted for 3.7 percent of the total food market in 2011. In addition to the increased import activity, the percentage illustrates a high demand of organic products on the German market. Organic products are popular among younger consumers as the new "Öko-Barometer" study indicates. 71 percent of the respondents under 30 years claimed to buy organic products. This is an increase of 16 percent when compared to the survey of 2010. According to another survey on costumer decisions for organic products, the most given reason with 89 percent was animal welfare, followed by the importance of the price with 71 percent (EMNID consumer survey 2012). Due to the high-priced feed for animal husbandry and the increased demand of organic animal products both, the retail prices and the sales volume, have raised. Despite higher prices and a higher sales volume, the economic situation in the organic market for animal products is strained. The high costs for feed and medicine restrict the conversion to organic farming to a greater extent. Animal welfare is, according to the EMNID-survey, the most important motive for buying organic products and is also one of the central goals in organic farming. “The EC regulations on organic farming exist since 1991. They are including all member countries of the European Union to protect the words "organic" and "bio". Since 2001 all organic products that meet the guidelines of the EU are denoted with a single organic label in Germany” explains Prof. Dr. Ute Knierim, professor for farm animal behavior and husbandry at the University Kassel the regulations for organic products. Farms that use the organic label are checked at least once a year. Large organic farming associations such as "Demeter", "Bioland" and "Naturland" also denote their products with this label. Most of these associations have even stricter regulations and controls which go beyond the ones of the EU. While the regulations for animal welfare in conventional farming have been improved in recent years, most of them accord now with the regulations for organic farming. The revised EU Organic Regulation (in force since 2009) defined clear objectives for organic animal husbandry and restricted further exceptions. The required minimum size of stables and outlets and the daily grazing, for example, are defined in these regulations. Moreover, they dictate the exact use of veterinarian pharmaceuticals and the feeding conditions for animal husbandry. While the expansion and discharge of stables and better transportation conditions for animals improved significantly, the regulations for organic feeding and the allocation of pharmaceuticals are causing problems for organic farmers. 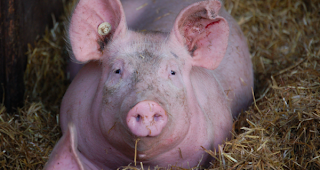 A 100 percent organic feeding for organic pigs was lately required by law for 2012, but represents some risks to health and product quality for monogastric animals (fowl and pigs). For solving these risks and for a deeper research, the 100 percent organic feed was made mandatory for 2015. Until then, a proportion of 5 percent of conventional protein sources is allowed in the feed ration - a regulation made with regards to the so-called protein gap in organic agriculture. Particularly in pig fattening, the amount of flesh is sufficient, because the farmer get paid for this percentage. “The highest amount of flesh can be reached by the right composition of diet. An optimal ratio of amino acids, in first priority Lysine, to Energy in the diet is essential for the pig for growing and run to flesh” explains Dr. Friedrich Weißmann, scientist at the federal von Thuenen-Institute for Organic agriculture. Since particular chemical substances in feed are not allowed in organic farming, the suitable soybean meal extract with optimal amino acid patterns is not usable. Instead, the organic farmer uses other protein-containing plants such as soybeans, field-peas, field-beans or potato proteins. Whereas in organic feeding the demand covering energy supply is unproblematic, the demand covering supply of the amino acids presents considerable difficulties due to missing products of organic protein origin and problems on further cultivation options for soy beans in Germany - due to the climate conditions. “In general, the organic pigs have two to three percent fewer flesh as the conventional pigs when they get slaughtered. It results in a higher fat content in the pork” describes Dr. Friedrich Weißmann the consequences of the protein-gap in organic farming. For the organic farmer this results in less profit due to the little percentage of flesh and a higher percentage of fat in the pork which is generally not preferred among consumer, as Dr. Friedrich Weißmann noticed. The 2011 data published by the BÖLW (Bund ökologischer Lebensmittelwirtschaft) about the organic pork sector confirm the presumption. The demand for organic meat has increased by 28 percent in 2011. With a growth rate of 0.6 percent the pork sector contributed only with a small part to it. While preventive treatment is forbidden in organic farming, the pig can be treated with antibiotics in case of disease, but just once in a life-time for animals not older than one year. Results of several studies demonstrated that the pigs would suffer in both, conventional and organic farming and require antibiotic treatment. While many diseases appear more often in conventional farming, other diseases like parasite infestation are likely to appear in organic pig farming. “Generally the frequency of diseases in conventional and organic pig farming does not differentiate. Due to smaller stocks and more outlets, infections in organic farming do not spread that easily. In conventional farming thereby, the hygienic standards are less critical, because of slatted floors” explained Matthias Link, veterinarian on organic and conventional farms since twenty years. According to him, also organic pigs can be carriers of resistant bacteria – a problem that is mainly associated with the conventional pig farming though. Once a disease appears a second time and the pig has to be treated, it can not be sold as organic pig anymore. The non-treatment of suffering pigs is highly questionable, anyhow a few “black sheep” of the organic sector use to leave them suffering in order to get the better sales price for organic produced pork. The treatment of diseases with alternative medication is preferred and available in organic farming, but is reflected in higher treatment effort and often associated with longer recovering periods of the pigs. While the real health status of organic and conventional pigs has not been proved in a long term study yet, there are still improvements to be done for animal health: Organic protein sources like the soy cultivation in Germany needs to be pushed while research on alternative forms of disease control needs to be tested. Heinrich Rülfing would decide again for organic farming, even though it is economically risky and associated with a lot more work. That leaves hope that farmers change not only for economic and profitable reasons to organic farming, instead for animal welfare and the general belief in sustainability for Mother Earth.